BACKGROUND AND PURPOSE: MRV has been proposed as a possible screening method to identify chronic cerebrospinal venous insufficiency, which may play a role in MS. We report our initial experience comparing MRV and CV in MS patients to evaluate venous stenosis and collateral venous drainage. MATERIALS AND METHODS: Time-of-flight and time-resolved imaging of contrast kinetics MRV and CV were performed in 39 MS patients. The presence and severity of both IJ vein caliber changes and non-IJ collaterals were graded by using a 4-point scale by 2 radiologists in an independent and blinded manner. RESULTS: Both studies frequently showed venous abnormalities, most commonly IJ flattening at the C1 level and in the lower neck. There was moderate-to-good agreement between the modalities (κ = 0.55; 95% CI, 0.45%–0.65%). For collaterals, agreement was only fair (κ = 0.30; 95% CI, 0.09%–0.50%). The prevalence of IJ segments graded mild or worse on CV was 54%. If CV was considered a standard, the sensitivity and specificity of MRV was 0.79 (0.71–0.86) and 0.76 (0.67–0.83), respectively. Degree of stenosis was related to the severity of collaterals for CV but not for MRV. CONCLUSIONS: IJ caliber changes were seen in characteristic locations on both MRV and CV in MS patients. Agreement between modalities was higher for stenosis than for collaterals. If CV is considered a standard, MRV performance is good but may require additional improvement before MRV can be used for screening. One point raised by these reports is that the sonography methodology may be suboptimal. It was suggested that MR imaging has many attributes that may make it a desirable CCSVI screening method.5 Compared with sonography, MR imaging can visualize both intracranial and extracranial venous circulations and can provide assessment of the brain parenchyma. Furthermore, MR imaging is noninvasive, does not depend on technologist experience or use ionizing radiation, and can evaluate anatomic changes and their physiologic consequences. Conventional CV also is used to visualize the venous system as well as to perform interventions, but it is too invasive and costly to be used as a routine screening tool. 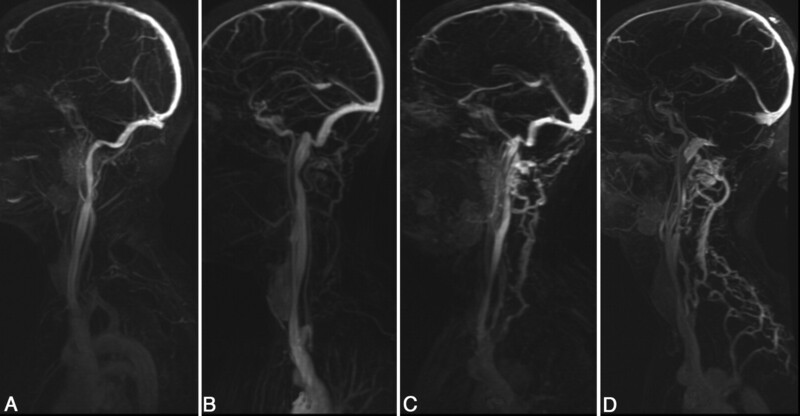 Although both phase-contrast and 2D TOF venography of the intracranial venous system have enjoyed widespread acceptance in clinical practice, experience with these techniques in the cervical veins is limited.6–11 Sundström et al4 recently reported a study of MS patients and normal subjects in which they used phase-contrast venography to quantify venous blood flow in the IJ veins and found no differences in bulk blood flow. Furthermore, they identified only 3 of 21 MS patients (14%) with venous stenosis, a far lower proportion than that suggested by prior sonography reports. Zividanov et al10 suggested that MRV could not detect any significant differences in venous occlusion or near-occlusion between MS and normal subjects. Hojnacki et al9 evaluated the ability of MRV to predict CCSVI (based on sonography criteria) and concluded that MRV was inadequate in this regard. Rather than address whether MS patients met sonography criteria for CCSVI, we undertook the current study to evaluate how often MRV and CV identified IJ caliber changes and prominent non-IJ collateral venous drainage in MS patients. In addition, we determined the agreement between modalities, to assess whether MRV could potentially be used as a screening tool to triage a patient to subsequent CV. We obtained approval from our Institutional Review Board for a retrospective study of MS patients who underwent both MRV and CV within a 24-hour period. Patients were included if they had a CV study and an MR imaging that included both 2D-TOF and TRICKS MRV of the neck. All such patients between April and December 2009 were included. All patients were imaged at 1.5T (Signa; GE Healthcare, Milwaukee, Wisconsin) by using the head-neck vascular array coil. Coronal intracranial 2D-TOF MRV was performed with the following parameters: TR/TE, 40/5 ms; flip angle, 60°; section thickness, 1.5 mm skip 0; FOV, 22 cm; matrix, 256 × 128; posterior saturation band. Precontrast axial 2D-TOF venography was performed from the skull base to the superior vena cava–azygous junction without saturation bands, with the following parameters: TR/TE 34/9 ms; flip angle 30°; section thickness 5 mm skip 0; FOV 24 cm; matrix 384 × 192. Contrast-enhanced sagittal TRICKS MRV was performed during the bolus administration of gadopentetate dimeglumine, 0.1 mmol/kg, flow rate 3 mL/s, with the following parameters: TR/TE 6/1.3 ms; flip angle 30°; section thickness 1.7 mm skip 0; FOV 40 cm; matrix 416 × 192. Time-resolved MIP images at 6.4 seconds intervals were created and used to determine the phase with the most venous opacification. Using this phase, separate left and right sagittal MIP images were created to evaluate slow-flowing posterior paraspinal collateral venous flow. After informed consent was obtained, patients underwent CV in an angiographic suite. Imaging was performed by using a fixed digital angiographic system with a single-plane flat panel detector (AXIOM Artis; Siemens Medical Systems, Erlangen, Germany). All studies were performed with local anesthesia and conscious sedation. Blood pressure, electrocardiogram, and arterial oxygen saturation values were monitored during the procedure. Femoral venous access was used in all cases for insertion of a 0.1-cm (0.035)-inch guidewire (Angle Glidewire; Terumo, Tokyo, Japan) and 5F angiographic catheter (Angle Glidecath, Terumo) that were advanced under fluoroscopic guidance into the IJ veins. With the catheter tip in the sigmoid sinus, hand injections of contrast media (Iohexol, 300 mgI/mL; GE Healthcare) were followed by rapid sequenced digital imaging over the neck and upper chest. 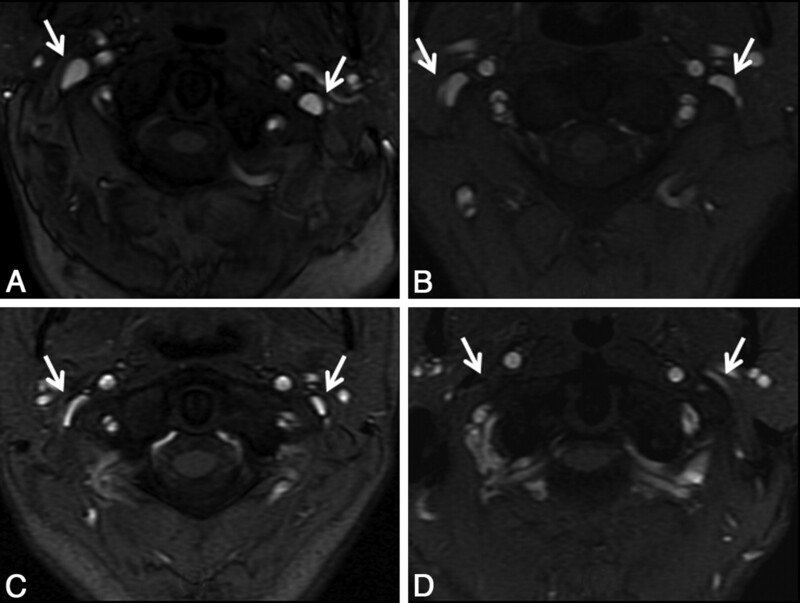 Imaging of both IJs was performed in multiple obliquities, with at least 5 different views obtained per side. In some cases, the catheter tip was repositioned to facilitate focused imaging of a particular venous segment. After venography, the catheter was removed and hemostasis at the groin was achieved with manual compression. There were no immediate complications identified. Intracranial 2D-TOF MRV, cervical 2D-TOF venography, and TRICKS were evaluated by a neuroradiologist blinded to the results of CV. The IJ veins were assessed at 3 levels: high (C1–3), mid (C3–5), and low (C6-T2), based on the 2D-TOF MRV. The venous caliber was scored as follows: 0, normal round or ovoid appearance; 1, mild flattening; 2, moderate flattening; and 3, severe flattening or not visualized (Fig 1). A composite score was created for each IJ (range, 0–9) to allow a measure of the total amount of IJ stenosis and to compare with collateral evaluation, as described below. This was the primary method to analyze the IJ caliber; however, the same neuroradiologist performed a similar analysis several months later, blinded to the results of the 2D-TOF MRV images, by using axial reformatted images (5-mm section thickness) from the venous phase of the contrast-enhanced TRICKS sequence. Collaterals were evaluated by using the TRICKS images, focusing particularly on the presence and caliber of posterior paraspinal veins. Scoring of the right and left sides separately was performed by using the following scale: 0, none to minimal; 1, mild; 2, moderate; and 3, severe (Fig 2). Qualitative grading of venous stenosis between 0 (none) and 3 (severe). Examples at the high IJ vein level demonstrate either no stenosis (A) or bilateral mild (B), moderate (C), and severe (D) stenosis. In some severe cases, the IJ was not visualized, as on the right in this example. The cases shown are bilateral for the purposes of example, but in general, left-right asymmetry in the degree of stenosis was more common. Grading scale for collateral venous flow. Images shown are sagittal MIPs of either the left or right side of the neck from TRICKS MRV from the phase with the most venous opacification. Collateral scorings shown are: (A) none, 0, (B) mild, 1, (C) moderate, 2, and (D) severe, 3. In severe cases, prominent collaterals were sometimes seen over the posterior neck regions, as in this example. CV was evaluated by the interventionalist radiologist who performed the procedure, by using the same grading system, with the radiologist blinded to the MRV images and scores. Analysis was performed on a per-segment level, such that each individual contributed 6 scores (left and right side; high, mid, and low IJ). To assess agreement between the 2 imaging modalities, κ measures with squared discrepancy weights (equivalent to an interclass correlation) were calculated. Confidence intervals were calculated with a 2000-replication bootstrap, adjusted for clustering. Scores were also dichotomized between normal (score = 0) and abnormal (score = 1 –3), and unweighted κ was determined. This was similarly performed for collateral scores. Considering CV as a standard, sensitivity and specificity were calculated for the dichotomized (ie, normal versus abnormal) scores. Also, because we were interested in the use of MRV as a screening tool, we determined the sensitivity and specificity of MRV if a single severe rating was used as a trigger for performing a CV examination. The CV examination was considered positive if it also detected severe stenosis. Finally, we compared the correlation between the composite vein stenosis scores with the assessment of the collaterals on each side to determine whether increasing amounts of stenosis seen on either MRV or CV were related to the presence and severity of collaterals by using a rank correlation with 95% CIs based on 5000 bias-corrected bootstrap samples adjusted for clustering within patients. All statistical analyses were done with Stata Release 9.2 (StataCorp LP, College Station, Texas). Thirty-nine patients met the inclusion criteria: 13 men and 26 women, with a mean age of 46 years (range, 22–67 years). The type of MS was as follows: 22 relapsing-remitting, 5 primary-progressive, and 12 secondary-progressive. The patients had relatively severe EDSS scores (median, 5.5; range, 1.5–8.5). All intracranial venograms were unremarkable without stenoses in the deep or superficial system; there was no evidence of retrograde flow in the deep cerebral veins. 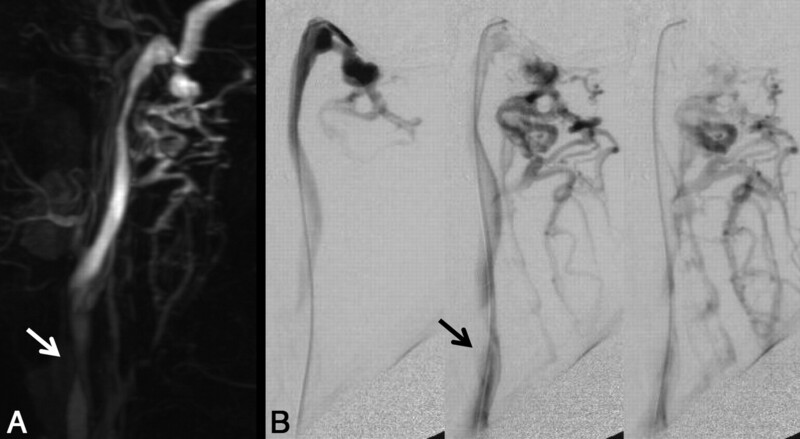 However, MR venogram images of the neck demonstrated multiple regions with decreased IJ caliber or focal nonvisualization. These were most common in the upper (C1–2) and lower (C6-T2) levels (Fig 3). Figure 4 shows a comparison of one of these high IJ stenoses with corresponding CV images. 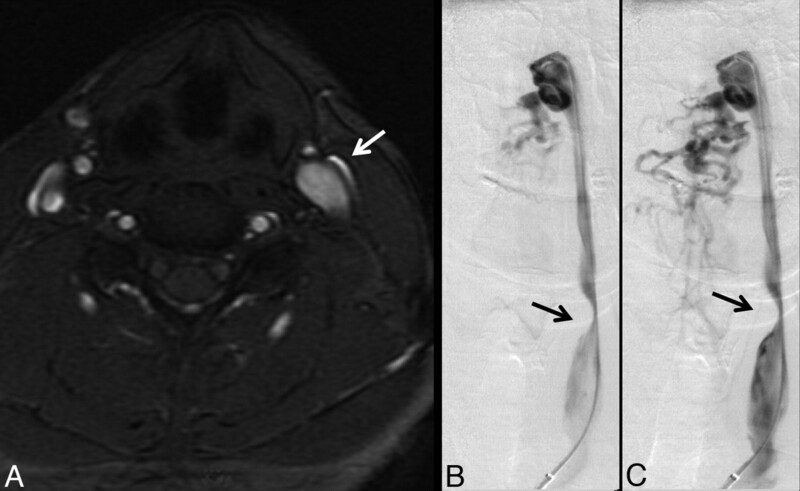 Less commonly, focal stenosis was seen in the mid-IJ at the C3–5 level, where it seemed that there was compression by the internal carotid artery (Fig 5). Although there was often good correspondence between the CV and MRV studies for stenosis in the upper and midportions of the IJ, the relationship in the lower neck was more variable. Figure 6 shows an example of discordance between the methods, in which the MRV demonstrated apparent stenoses and the CV study demonstrated patency. Posterior paraspinal collaterals were evident in many patients and best visualized by using the TRICKS sequence, because their very slow flow often made them inapparent on 2D-TOF venography. 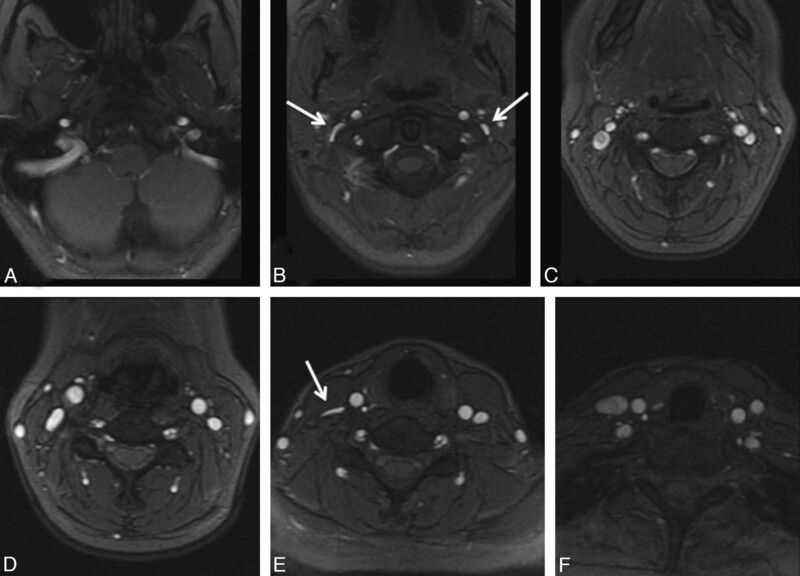 Comparison images of non-IJ collaterals in a representative patient are shown as Fig 7. A 35-year-old woman with relapsing-remitting MS diagnosed 5 years before imaging showing characteristic locations of venous abnormalities on 2D-TOF MRV. In the upper neck (A–C), flattening was often seen near C1 (arrows, B). In the mid- and lower neck (D–F), flattening can be seen between the sternocleidomastoid and anterior scalene muscles on the right (arrows, E). A 38-year-old woman with relapsing-remitting MS for 3 years. A, High IJ stenosis adjacent to the right C1 lateral mass (arrow). B, CV shows the focal stenosis, whereas a delayed image (C) shows associated non-IJ collateral venous vessels. The left IJ seems normal on CV. The right high IJ was graded severe on both MRV and CV; the left IJ was graded by MRV as mild stenosis, due to the slightly flattened appearance, whereas it was called normal on CV (not shown). A 36-year-old man with relapsing-remitting MS for 2 years, showing severe stenosis of the left mid-IJ on MRV (A) and early (B) and late (C) phases of CV (arrows). Enlarged posterior paraspinal venous collaterals are also noted on the venogram. In certain individuals, the course of the carotid artery swings across the IJ vein at this level, possibly causing compression. A 41-year-old woman with relapsing-remitting MS for 6 years. A, MRV demonstrates moderate right (arrow) and severe left (arrow) lower IJ stenosis. CV demonstrates no appreciable stenosis in the low IJ segment on either side. Unsubtracted (B) and subtracted (C) CV after right IJ injection; unsubtracted (D) and subtracted (E) CV after left IJ injection. The cause of this lack of agreement between modalities remains unclear, though the degree of stenosis was less severe on the TRICKS images (F). A 47-year-old man with 2 years of relapsing-remitting MS. A, Lateral view of MIP image of the left neck from TRICKS MRV. B, Multiple frames from CV with injection of the high left IJ. Both modalities rated the posterior paraspinal collaterals in this patient as moderate. An arrow points to a location of stenosis noted in the mid-IJ. Table 1 details stenosis grades by location for both modalities. IJ stenoses were more frequently present in either the high (C1–2) or low (C6-T2) level, compared with the midportion (C3–5). For the low IJ, the percentage of vessels that were graded as abnormal (scores 1–3) was 62% for both CV and MRV. For the high IJ, the same percentage was 78% for both modalities. In contrast, in the mid-IJ region, the percentage of abnormal vessels was much lower: 23% for CV and 22% for MRV. The frequency of severe stenosis at any level on a per-patient basis was 59% for MRV and 46% for CV. The κ measures of agreement between the techniques are shown in Table 2. For the 4-point scale, weighted κ was 0.54, whereas for the dichotomized scale, the unweighted κ was 0.55. For both full and dichotomized scales, there was significantly lower agreement for the lower IJ segments, which were not significant by using either metric. The κ values for the upper and mid-IJ regions were higher, in the range of 0.58–0.67. On-line Table 1 details the agreement between the 2D-TOF MRV and the lower resolution contrast-enhanced TRICKS images. The weighted κ was 0.83, which represents excellent agreement. For this reason, agreement between the TRICKS estimates of stenosis and CV were similar to those presented for 2D-TOF MRV (On-line Table 2), though overall sensitivity and specificity (see below) are slightly lower for TRICKS than for 2D-TOF MRV. If CV is considered the criterion-standard measurement, the prevalence of at least mild 2D-TOF MRV stenosis for all segments is 54% (95% CI, 47%–63%). For the MRV method, we calculated the sensitivity, specificity, PPV, and NPV (95% CIs for MRV of 0.79 [0.71–0.86], 0.76 [0.67–0.83], 0.79 [0.71–0.86], and 0.76 [0.67–0.83], respectively). If only severe stenosis in any vein segment is considered to represent a positive study for an individual patient, the performance of MRV for predicting a positive CV examination was similar (Table 3): sensitivity, 0.83 (0.57–0.96); specificity, 0.67 (0.43–0.85); PPV, 0.68 (0.45–0.82); and NPV, 0.82 (0.56–0.95). A wide range in the number and size of collateral vessels in the posterior paraspinal regions was seen (Fig 2). Overall, the collateral scores were on average slightly higher on MRV than on CV (mean, 1.76 versus 1.33; P = .002 based on paired Wilcoxon rank test). The prevalence of collaterals rated as severe was 14% for CV and 21% for MRV. Agreement was less than that for stenosis, with a weighted κ of 0.30 (95% CI, 0.09%–0.49%; P = .002) for the 4-point scale (Tables 4 and 5). There was poorer agreement on the dichotomized scores, with a κ of 0.18 (95% CI, −0.02%–0.40%; P = .012), and, given corrections for multiple comparisons, this value was not significantly different from chance. There was slightly higher agreement for the left-sided collaterals than the right-sided collaterals. 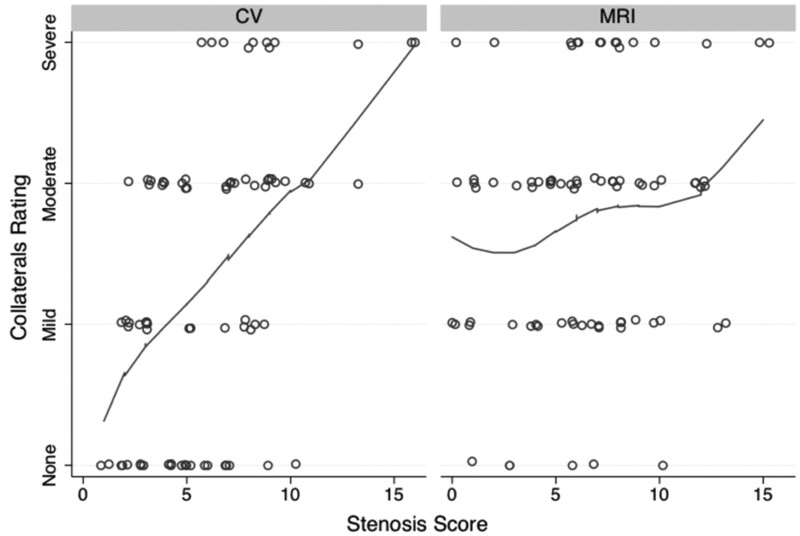 Figure 8 shows the relationship between collateral scores and whole-vein composite stenosis scores. There was a significant correlation between increasing collateral score and composite IJ stenosis score for the CV studies (ρ = 0.49; 95% CI, 0.33%–0.64%) but not for the MRV studies (ρ = 0.18; 95% CI, −0.08%–0.42%). Relationship between collateral rating versus composite IJ vein stenosis score. There was a significant relationship between more non-IJ collaterals and increasing stenosis for the CV examination (ρ = 0.49) but not for the MRV examination (ρ = 0.18), based on rank correlation. Line is a locally weighted regression smoother. Points have been jittered for clarity. This study presents our initial experience with MRV and CV in MS patients. This allows an estimation of the prevalence of imaging-based abnormalities in intracranial and IJ veins. In contrast to the sonography study of Zamboni et al2 we found no evidence for reflux in the deep cerebral veins of any of our patients. We found, however, that IJ stenosis was more common that reported in smaller cases series in prior literature.4,9 Sundström et al4 reported stenoses in 3 of 21 (14%) MS patients by using TRICKS, and they described these stenoses to be in the midportion; the criteria were that of visual assessment of a neuroradiologist and not further described. Hojnacki et al9 reported “abnormal” IJ veins in 3 of 10 (30%) MRV examinations of MS patients, considering either absent or pinpoint IJ contours to represent abnormality. In contrast, we found at least mild stenosis in 126 of 234 (54%) segments evaluated by either CV or MRV. In fact, even if only severe stenoses are considered, the prevalence of stenosis in at least 1 segment on a per-patient basis was 46% and 59% for CV and MRV, respectively. Based on the lack of agreement with CV in the lower IJ segments, MR may overestimate the prevalence of severe stenoses. Other reasons for the discrepancy may relate to differences in the patient cohorts, because our patients were older and had higher disability scores than those in the other studies. However, we saw no significant trend in our data relating age or EDSS with increasing stenosis severity. Finally, it is possible that the difference is related to the precise MRV methodology; the current study primarily used noncontrast 2D-TOF MRV to assess stenosis; the other studies also used contrast-enhanced TRICKS for this purpose. The 2D-TOF may overestimate stenosis in the setting of turbulent or slow flow, but it does have higher spatial resolution. Despite this theoretic concern, we did not observe significant differences in our cohort between stenosis as graded by noncontrast 2D-TOF MRV or contrast-enhanced TRICKS. When stenoses were visualized, they tended to occur in characteristic locations. The most common lesion and that in which the agreement between the modalities was highest was the high IJ. When abnormal, the IJ vein usually seemed flattened up against the C1 lateral masses and transverse processes. The next most commonly affected segment was the low IJ, where it was frequently seen flattened between the sternocleidomastoid and the anterior scalene muscles. These findings are similar to Hojnacki et al,9 who divided veins into upper and lower segments for the purposes of analysis. We examined 3 segments (upper, mid, and lower), because we identified clear narrowing in the mid-IJ in a small subset of patients, where the vein seemed to be compressed by the internal carotid artery. There was no agreement between CV and MRV for low IJ stenosis, with the IJ frequently appearing slitlike on MRV even when it looked relatively normal on CV (Fig 6). The reasons for this remain unclear but could relate to the relative insufflation that might occur to a collapsed vein under the small increased pressure associated with contrast injection or be the result of difficulty in acquiring a projection truly perpendicular to the short axis of stenosis. Also, flow may be very slow and therefore not identified as flow-related enhancement on 2D-TOF images. Another consideration is possible changes in the shape of the vein during the cardiac or respiratory cycles, which are necessarily averaged over the MR measurement on our ungated images. Other possibilities, such as compression by the MR imaging coil, also could be considered. This remains an active source of investigation, and we now interpret the low IJ segments with caution. CV has several important advantages, including the ability to perform pressure gradient measurements and interventional procedures; however, its invasiveness and radiation dose make it suboptimal as a first-line test. It is also operator-dependent, only projection views are routinely obtained, and stenosis assessment may depend on the precise locations and rates of contrast injection. Nevertheless, if CV is considered the standard method, the sensitivity and specificity of MRV in our study was 79% and 76%, respectively, on a per-segment analysis. If only severe stenosis in any vein segment is considered a trigger for subsequent CV examination, then we found a sensitivity and specificity of 83% and 67%, respectively, for the MRV examination. Of note, the NPV is relatively high (82%), important for a screening technique. The MRV performance is higher than that reported by Hojnacki et al,9 who found a sensitivity of 25% and 31% for 2D-TOF and TRICKS, respectively, for predicting a positive CV study. This is related partially to their overall lower frequency of abnormal IJ findings on MRV. However, it is primarily due to the fact that 100% of their 10 MS patients had abnormal IJ veins on the CV study, compared with only 46% in the current study. It is important to note that this prior study was limited to 10 MS patients only; thus, the CIs in the performance metrics are much wider than the current study. We examined whether patients with more stenoses had more non-IJ collaterals. Intuitively, one would expect more non-IJ collaterals to be present if the main pathways of blood drainage from the head, the IJs in the supine position,6 have stenoses that are significant enough to impede flow. This was true for CV but not for MRV. This may be due to the lack of agreement of MRV and CV regarding the low-IJ stenoses, in which the MRV tended to overestimate the stenosis seen on the CV examination. The study had several limitations. First, we have examined only IJ venous caliber changes and have used the terms flattening, narrowing, and stenosis somewhat interchangeably; there are no physiologic data presented in this report that suggest that the observed caliber changes have any relationship with pathology. Importantly, we did not have a control group to assess how frequently such findings would be seen in normal or non-MS subjects. There are relatively few data on the appearance of the cervical venous system in normal patients, though clearly there are more variations than for the arterial circulation.15 One prior sonography study found that the dominant venous drainage pathway was not via the IJ veins in only 6% of normal subjects.6 However, one important goal of the study was to assess the agreement between CV and MRV, and it was not feasible to perform CV in normal subjects. Another drawback is the use of a subjective grading scale rather than quantitative measures, such as IJ or collateral flow rates. Zamboni et al2 have reported a cross-sectional area of 0.3 cm2 as a criterion for CCSVI. Although we did not measure the cross-sectional areas for all of the veins in this study, which is in fact somewhat challenging due to the crescentic or flattened shape of many of the vessels, we estimate that most of the vein segments graded as moderate or severe stenosis were below this cutoff value. Other quantitative techniques such as 4D flow and arterial spin-labeling perfusion imaging were acquired in a subset of these patients, and given the relative complexity and wealth of information obtained from these studies, will be reported separately. On either MRV or CV, IJ stenosis was a frequent finding in this cohort of MS patients and occurred at characteristic locations, especially the high IJ at the level of the C1 lateral masses and in the lower neck between the sternocleidomastoid and anterior scalene muscles. Agreement between the modalities was moderate-to-good for stenosis but only fair for the assessment of non-IJ collaterals. In particular, there was no agreement between modalities for evaluating the low IJ region. If CV is considered the standard, then the performance of MRV is relatively good. It is possible that improvements in the MR technique could lead to better predictive ability, though some of the variability may be related to interpretation of the CV examination. Disclosures: Greg Zaharchuk, Research Support (including provision of equipment and materials): GE Healthcare, Details: Research support – moderate, Consultant: GE Healthcare, Details: Neuroradiology Advisory Board; Robert Herfkens, Research Support (including provision of equipment and materials): General Electric, Details: research in IT and MI pulse sequence evaluation, Consultant: General Electric, Details: Advisory Board; Michael D. Dake, Research Support (including provision of equipment and materials): Cook Medical, W.L. Gore, Details: Sponsor of Clinical Research Trial, Consultant: W.L. Gore, Abbott Vascular, Details: Member, Scientific Advisory Board. Accepted after revision December 26, 2010.